Sometimes you have to wonder why anyone would want to go into the punk business these days. There are kids to please, critics to wow and that awkward juggling act that pits your idealism against your career hopes. It almost makes it seem not even worth learning a few power chords if it’s all going to end like that, doesn’t it? 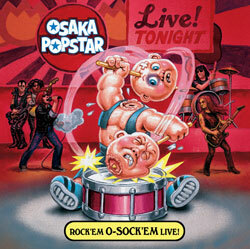 It doesn’t have to end in that super-serious world of modern punk, as Osaka Popstar proves once again with its first live effort, Rock’Em O-Sock’Em Live!. Like the band’s sole studio effort, Osaka Popstar and the American Legends of Punk, the project — which features members of The Ramones, Misfits, Black Flag and The Voidoids — is just out to have fun. That doesn’t mean sucking up to critics or giving Warped wannabes exactly what they want. But as things often go with punk rock, that’s usually the best way to please critics and fans. Rock’Em never shoots to be anything more than a hit-and-run blitz of cartoonish punk-rock escapism. Led by singer John Cafiero, the band pays homage to punk’s onetime love trash culture and its throwaway junk-food thrills. Theme songs from anime cartoons (“Astro Boy” and “Sailor Moon”) rub elbows with a trio of Ramones classics (“Blitzkrieg Bop,” “The KKK Took My Baby Away” and “Beat on the Brat”) and show the band isn’t really aiming for any high, artistic statement. A cover of a song written by the mentally handicapped Kids of Widney High (“Insects”) kills off any remaining chance of mistaking Osaka Popstar for a band that wants to make a huge, important statement. A few non-junk culture songs make it into the set list, Daniel Johnston’s “Wicked World” and “Blank Generation” by Richard Hell and the Voidoids. Surprisingly, the band translates its serious side well, transforming them into little more than goofy garage-rock covers. It’s hard not to enjoy a band that’s obviously having as much fun as Osaka Popstar. If this live set’s a little misguided, especially for a band with only a single studio album, it at least gives us one more taste of a throwaway masterpiece.